Acer's recently released Timeline range is ideal for corporate users, with machines offering great portability, style and comfort. The Aspire 4810T is a 14-inch machine and a truly great choice for the busy commuter. The most noticeable thing about this laptop is its compact size, as it features a very thin chassis. Not only does this mean it slips easily into laptop bags, but it also helps to deliver an ultraportable weight of just 2kg. The screen strikes a great balance between size and usability, and the widescreen aspect ratio creates more than enough space to open several documents at the same time. As with almost all laptops at this price, it's a Super-TFT panel with a glossy coating that helps to provide vibrant colours. It's less ideal when used in direct sunlight, however, with reﬂections showing up. Most things on this machine are conﬁgured for optimum power efﬁciency, so, along with LED backlighting for the screen, you'll also ﬁnd an integrated Intel graphics card. 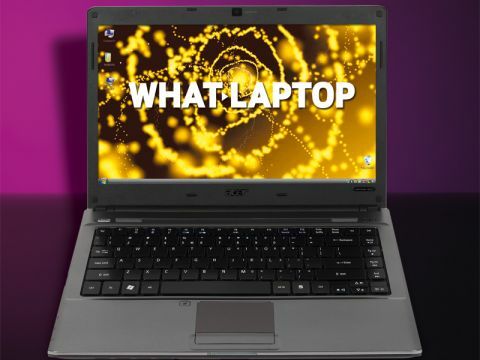 It offers limited 3D performance, but has enough power to run standard ofﬁce tasks or DVDs. The biggest power-saving comes through the use of a low-voltage Intel Core 2 Duo processor, running at 1.4GHz. Performance is inevitably compromised as a result, although 3072MB of fast DDR3 memory helps when it comes to multitasking, and we found it quick enough for most tasks. This laptop really comes into its own when it comes to battery life, however, where it lasted for an amazing eight hours between charges. The keyboard features an unusual layout, with ﬂat keys raised high above the main board. It feels very well made, with no sign of ﬂex or unwanted movement, but it's not at all practical. The completely ﬂat typing surface means it's very difﬁcult to distinguish between the keys when touch-typing, so expect some mistakes even from experienced typists. The 4810T still offers a full complement of features, however, despite the thin chassis. There's an integrated DVD rewriter on the right-hand side and the use of three USB ports makes it easy to add peripherals. Fixed and wireless connectivity is also comprehensive, with 802.11n Wi-Fi, Gigabit Ethernet and Bluetooth all present. A 5-in-1 memory card reader also offers compatibility with digital cameras and other devices. Limited 3D performance and the low-voltage processor mean the Aspire 4810T won't suit all users. It's a great choice for those needing all-day usability though, and the impressive quality and lightweight build are an added bonus.